If you have been involved in an accident and have suffered personal injuries, the outcome of your claim will depend heavily on whether or not you live in an at-fault tort state. Tort law governs all personal injury cases. Simply put, a tort is a civil wrong. In civil law, torts are the basis for lawsuits to compensate a grieving party for damages or injuries suffered as a result of the wrong. More states are at-fault than no-fault; some states operate under a modified version of no-fault laws. Nevada is a fault auto insurance state. This means that if you are involved in a Nevada auto accident, rather than you collecting coverage form your own auto insurance carrier to pay for damages and injuries suffered as a result of the crash, you will file a claim to collect coverage from the at-fault driver’s insurance company. Not surprisingly, the at-fault driver’s insurance carrier does not have your best interests in mind. It is true that in some Nevada car accidents fault is obvious, but it is very common for fault to be difficult to determine in most crashes. To be successful in a personal injury lawsuit, an injured victim must establish that the at-fault party was negligent. Negligence occurs when the at-fault party breached a duty owed and that breach caused the injuries suffered. Establishing fault in a Nevada auto accident is vital because the answer determines who is responsible to pay for damages. Living in an at-fault states also determines how your auto insurance carrier will handle a car accident that involves another party who is uninsured or underinsured. This is because if the at-fault driver has too little or no coverage, unless you have an uninsured motorist (UM) or underinsured motorist (UIM) clause in your policy, you will be hard-pressed to collect any compensation for damages suffered. Contributory negligence: This type of negligence is an “all-or-nothing” determination of fault. For a party to be awarded damages, that party cannot be found responsible for any portion—at all – of the auto accident. Strict comparative negligence: In this type of negligence, a party can seek damages even if partially found to be at fault. Damages can be awarded in proportion to the degree of responsibility of each party involved in the accident. Modified comparative negligence: This type of negligence limits a party's recovery up to a certain percentage of fault, at which recovery becomes impossible. While the theory of negligence used to determine compensatory damages can vary from state to state, Nevada Law utilizes modified comparative negligence when determining damages. This means that as long as the plaintiff is found to be less at fault than the defendant, he or she can collect damages. Damages will be reduced, however, by the amount of responsibility the plaintiff is found to be at fault for the crash. Being involved in a Nevada car accident can be stressful—on top of the other loss and injury you've experienced. Personal injury lawsuits involving car accidents involve property damage, physical injuries, and emotional as well as mental turmoil. Do not try to navigate the legal process alone. If you or someone you know has been injured in a Nevada car accident, or has suffered any other type of personal injury due to the fault of another, contact a Nevada personal injury lawyer today to find out your rights and obligations under state law. 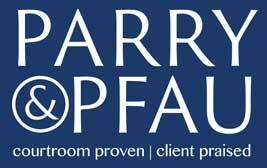 The aggressive attorneys at Parry & Pfau will protect your interests and those of your loved ones, guiding you every step of the way. Call (702) 879-9555 today or click here to schedule your initial free consultation.